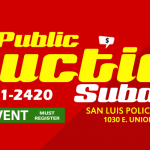 The San Luis Police Department provides public fingerprinting services to citizens. You must supply your own blank fingerprint card, obtainable from your employer, the Arizona Department of Public Safety or the agency that is requiring you to be fingerprinted. Mandatory/Arrest fingerprinting is also done at the police department, for our cases only. Refer to your Mandatory Fingerprint Compliance Form for more information. The San Luis Police Department is not authorized to fingerprint any individual for Immigration & Naturalization Services. -You may obtain fingerprint cards from the Department of Public Safety by calling (602) 223-2279 or by visiting www.azdps.gov/Services/Fingerprint for additional information.